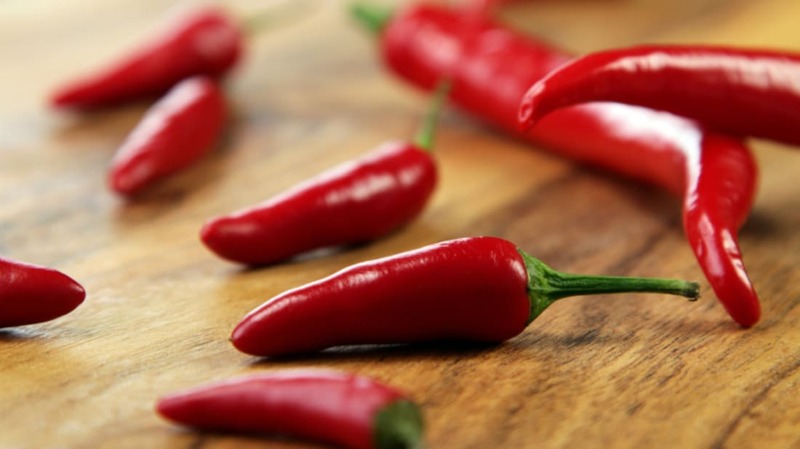 Can Too Much Spicy Food Burn Off Your Taste Buds? It all starts so innocently: You order the jalapeño burger, dribble on a little Tabasco, maybe add a dollop of that habanero salsa, and boom. Suddenly, you’re clutching the table, eyes watering as you signal for the waiter to bring you some cold milk. In all this self-induced pain, one has to wonder: Is this spice addiction taking a toll on your ability to taste? To answer the question, let’s first take a look at capsaicin, the heat-inducing chemical in spicy peppers. In the real estate of pain-inducing-toxic-yet-edible-chemicals, capsaicin has a monopoly: It is the sole proprietor of all heat found in peppers or pepper-infused products, ranging from curry blends to hot sauces to those little packets of taco seasoning at Taco Bell. After one bite of a hot pepper or a spicy dish, capsaicin is released from the membranes of the peppers, clips to the neurotransmitters that regulate temperature in your mouth, and screams out to those neurons that things are heating up. The brain registers the signal and reacts just as it would in the case of a real fire: by triggering your body's fight-or-flight response. Your heart speeds up, you start to sweat, and endorphins rush to the scene. Those endorphins put up a barrier to protect the tongue from the “fire,” which causes the mouth to go temporarily numb. But the endorphins’ numbing powers only last for so long before the heat and consequential pain creep back in, leaving you in tears and your taste buds temporarily busted. Thankfully, it all wears off in good time, but just how much time depends on the pepper’s capsaicin levels. The Scoville Scale is used to measure the capsaicin levels in every pepper from humble bell peppers to scorching Ghost peppers. The more Scoville Heat Units a pepper has, the higher the heat intensity (and the longer you’ll be in pain). Offered a chance to take a bite of the Guinness World Record-breaking Bhut Jolokia? Buckle in. You’ll be aching for the next 24 hours. But fear not, chile-head! Despite the unremitting agony brought on by capsaicin’s heat, the tongue’s exposure to capsaicin does not result in tissue damage to your taste buds. This is because taste and the heat are two different sensations and, as such, are interpreted by two different types of receptors (polymodal nociceptors for heat and pain, caliculus gustatorius for taste). Capsaicin only triggers the heat-sensing receptors—so, even though your entire tongue may feel numb, your taste buds in fact remain unaffected. While spicy foods don't cause long-term tissue damage, it's possible to improve your spice tolerance over time by integrating more capsaicin into your diet in small doses. Start with a pinch of cayenne or sprinkle some chile flakes on your pizza. Over time, the heat receptors on your tongue build up a degree of resistance to the toxin. So, while you’ll always experience the heat, it won’t be nearly as intense as that first time you chomped into curry. In the meantime, keep a glass of milk close at hand when you tuck in to taco night. Studies show that capsaicin dissolves in the presence of fat, alcohol, and casein (a protein found in dairy). Unlike water (which spreads the capsaicin around), these substances surround and absorb the capsaicin on your tongue. But whether you choose to seek sweet dairy relief or wait out the pain, your taste buds remain unaffected, so go ahead. Pour on the Sriracha. Your taste buds will be just fine.